The crucifers include cabbage, cauliflower, broccoli, Brussels sprouts, turnips, radishes, kale, rutabaga, mustard, collards, horseradish, and other crucifers. All of the crucifers are subject to attack by insects. Some, such as radishes, can usually be grown without insect damage and others, such as cabbage, must be managed carefully to avoid serious insect damage. 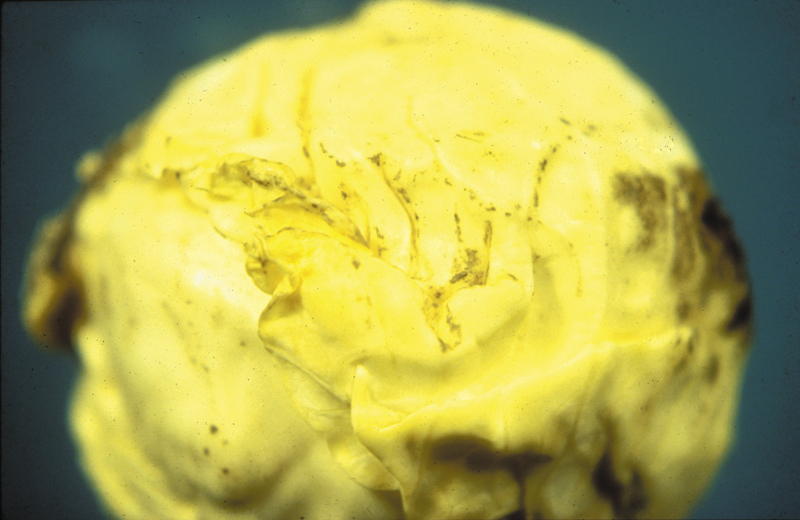 The first insect of concern on crucifers is usually the cabbage maggot. Cabbage maggot overwinters as pupae in the soil. 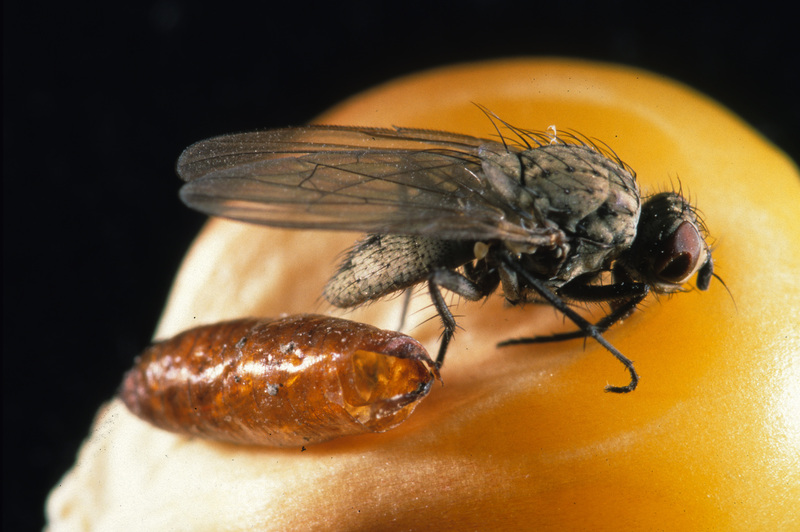 The flies, slightly smaller than a housefly, emerge from the soil in late April or early May and lay white eggs at the bases of newly set plants. Emergence usually coincides with the time when yellow rocket, a common weed, is in full bloom. 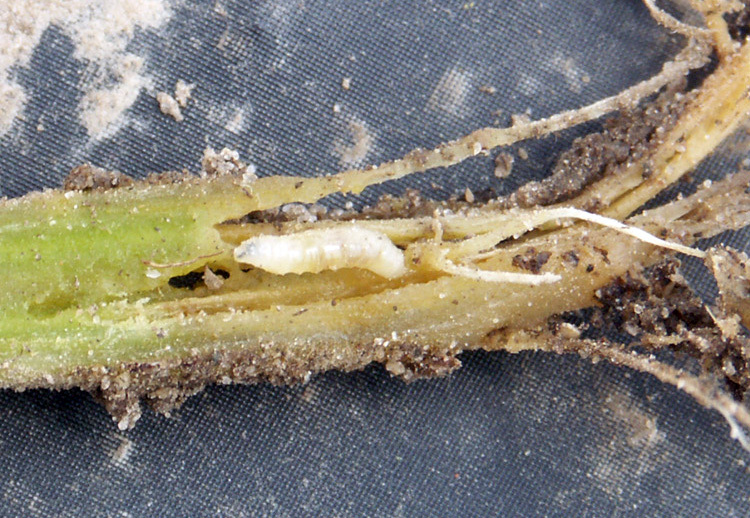 Larvae from this first generation tunnel in the roots of small plants, causing the plants to appear sickly, off color, or stunted, and may cause them to die. The larvae are small, legless, white maggots, reaching a maximum length of about 1/4 inch. Broccoli and cauliflower usually suffer more cabbage maggot injury than cabbage. Cabbage maggot injury is favored by cool, wet conditions. Disk crop residues immediately after harvest to reduce overwintering populations. Plant in well-drained soils when soil temperatures exceed 50°F. Do not plant in fields to which animal manure has been recently applied or in which a cover crop has been plowed down within 3-4 weeks of planting. Use the soil insecticides diazinon, Lorsban, or Capture LFR in the seed furrow or as transplant drenches. 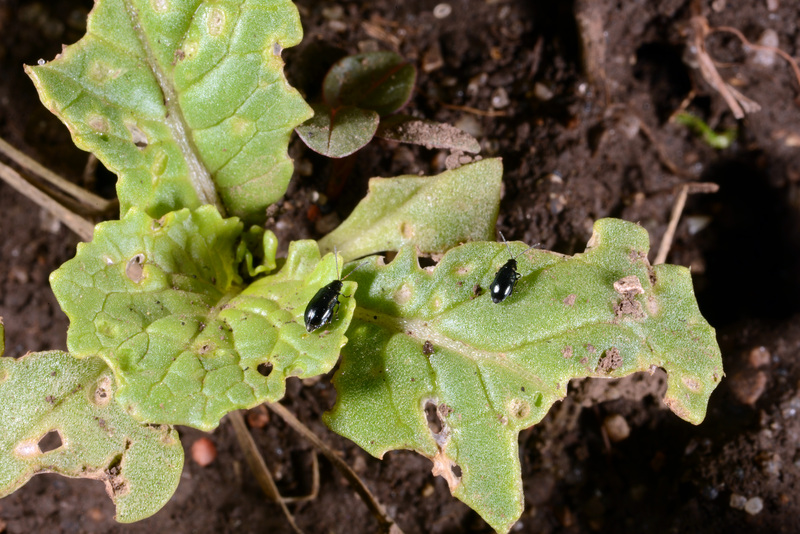 Flea beetles are almost always a pest of crucifers, especially early in the growing season. Flea beetles are small, hard-shelled insects, so named because their enlarged hind legs allow them to jump like fleas when disturbed. They usually move by walking or flying, but when alarmed they can jump a considerable distance. Most flea beetle damage is distinctive in appearance. They chew a small hole (often smaller than 1/8 inch in diameter) in a leaf, move a short distance, then chew another hole, and so on. The result looks like a number of “shot holes” in the leaf. While some of the holes may meet, very often they do not. 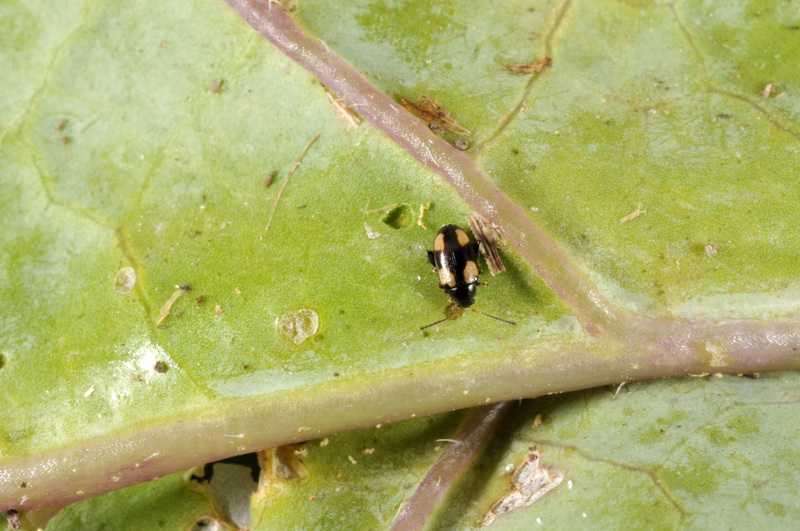 Two of the species of flea beetles that commonly attack crucifers are the striped flea beetle and the palestriped flea beetle. The adult striped flea beetle is shiny black, about 1/12 inch long, with a longitudinal, wavy, yellowish stripe on each wing cover. The larvae may also feed on the roots, especially of turnips and radishes. The palestriped flea beetle is about 1/8 inch long, but ranges in color from shiny reddish to brownish-yellow. A straight, broad, yellow stripe runs down each wing cover. Most plants can tolerate considerable flea beetle feeding. However, younger plants could be killed, and older ones may suffer from water loss and reduced photosynthetic capability. Problems from flea beetles can be reduced by deep disking of crop residues and by maintaining good weed control. Early planting will often allow plants to grow past the most vulnerable stages before flea beetles become active. Seedlings should be treated if there is an average of at least 1 flea beetle per plant. Older plants can tolerate much higher populations. Flea beetles are easily controlled with many common insecticides, including many targeted at caterpillars. Aphids are soft-bodied insects that feed in colonies, usually on the undersides of the leaves. Three species of aphids are commonly found on crucifers. All species of aphids are about 1/16 inch long. Cabbage aphids are gray with very short cornicles (tailpipes) and the abdomen has a triangular tip. 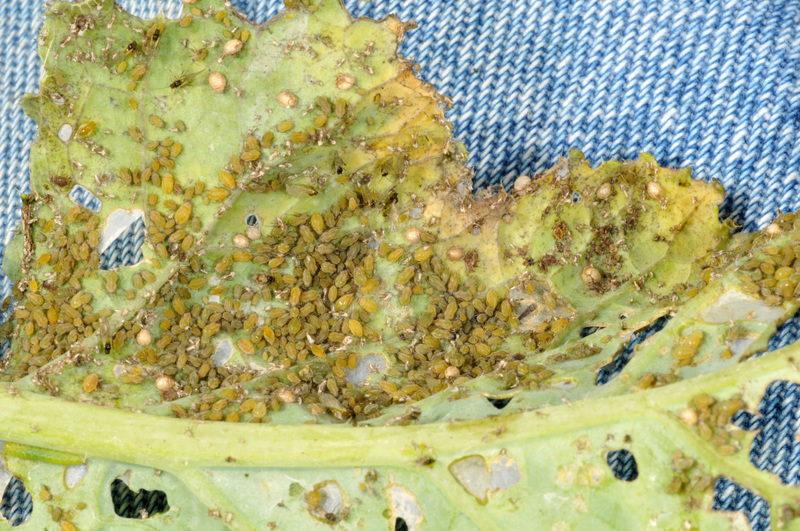 Turnip aphids are grayish green and the abdomen has a slender tip. Green peach aphids can come in many colors and have long cornicles. Aphids begin moving into fields in June. There may be a few winged aphids present, but most will be wingless. Aphids are capable of rapidly increasing in numbers because of their ability to reproduce without mating and to give birth to live young. Aphids feed by sucking plant juices, causing leaves to curl, and the plants to wilt if the infestation is heavy enough. 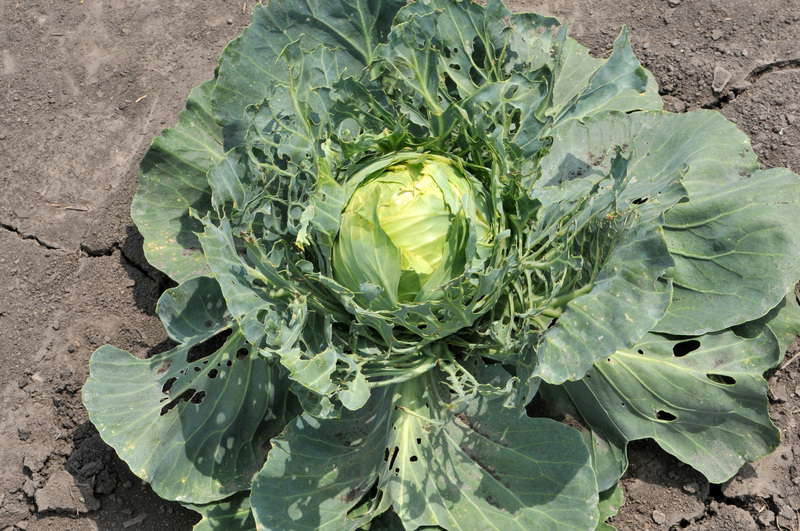 Severe feeding may stunt the plants and may prevent cabbage from forming heads. Aphids also produce a substance called “honeydew” that acts as a substrate upon which sooty mold can readily grow. A successful aphid management program consists of several parts. Destruction and removal of crop residues immediately after harvest minimizes the spread of aphids to adjacent plantings and eliminates possible overwintering sites. Growers should inspect transplants before planting for the presence of aphids and other insects. Treating before planting is much more efficient than after the plants are in the field. Aphid populations are held in check by several diseases as well as a number of parasites and predators. Many of these parasites and predators are very susceptible to many chemical insecticides (other than those containing Bacillus thuringienis). Limiting the use of chemical insecticides will preserve the beneficial insects and help to keep aphid populations under control. Finally, if aphid populations get so high that biological control is not effective; the use of chemical insecticides can help to reduce aphid numbers to a tolerable level. Broccoli and cauliflower should be treated when populations reach 100 aphids per plant before heading or 5 aphids per plant after heading. Cabbage should be treated when 2% of the plants are infested. Several insecticides are available for aphid control, including Actara, Admire Pro, Assail, Belay, Beleaf, Dimethoate, Fulfill, Platinum, Movento, Provado, Sivanto, and Venom. 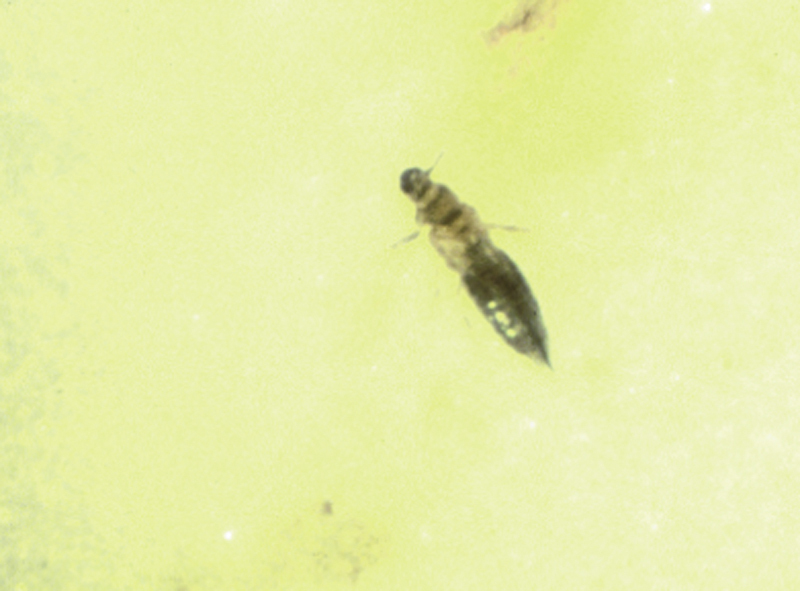 Adult onion thrips are very small (1/16 inch long), long, slender, and pointed at both ends. The wings are slender and fringed with long hairs. The color varies from white to yellow or brown. Immatures are similar in shape but lighter in color, smaller, and slower moving. Both adults and larvae overwinter in clover, alfalfa, and wheat. In late spring and early summer the thrips will move to vegetables. This often occurs when a wheat field is drying down or is harvested. Thrips problems tend to be worse in hot, dry weather. Heavy rains reduce thrips populations by washing the insects off the plants. Thrips cause damage by rasping small holes in the leaves and sucking up the exuding sap. 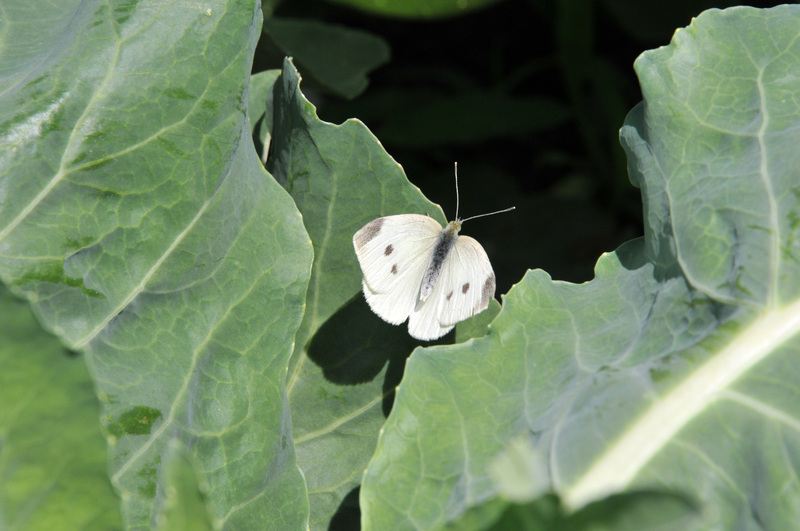 Feeding on cabbage causes small, silvery areas with black specks on the frame leaves and bronze, rough areas on and in the head. Feeding damage may reduce yield somewhat, but, more important, may render the cabbage unacceptable for fresh market sales. Cabbage fields should be scouted about the time wheat is maturing and being harvested. Look for thrips in areas next to wheat or other grasses. Control is much easier if thrips populations are detected early, before heads begin to form. Once thrips are within the head, it is extremely difficult to control them with insecticides. If possible, insecticides should be applied in large volumes of water (100 gallons per acre) so that the insecticides will get into the areas of the plant where thrips are feeding. Onion thrips generally prefer cabbage varieties with very tight heads to those with loose heads. Red varieties may have lower number of thrips than green varieties. Although no cabbage varieties are immune, several varieties are less sensitive than others to thrips damage. Check with your seed dealer for varieties with thrips resistance. Insecticide treatment should be considered if thrips populations are increasing as cole crops are beginning the cupping stage or curd formation. Insecticides available for thrips control include Actara, Admire Pro, Ambush, Assail, Baythroid, Brigade, Entrust, Exirel, Mustang Maxx, Radiant, and Warrior. Control of caterpillars is the most important part of an insect pest management program on crucifers. All other pest management decisions should be made with control for caterpillars in mind. Whenever possible, choose insecticides for other pests that will also control caterpillars. There are three important caterpillar pests of crucifers in Indiana, the imported cabbageworm, the cabbage looper, and the diamondback moth. Each of these caterpillars will feed on leaves and heads. All are capable of producing serious damage to most crucifers. The adult imported cabbageworm is a common white butterfly with black spots on the forewing that can be observed flying early in the spring. The female butterfly lays bulletshaped yellow eggs singly, usually on the undersides of leaves. Egg-laying usually begins in late May or early June. A female can produce up to 200 eggs. The imported cabbageworm is a sluggish green caterpillar, exceeding 1 inch in length at maturity, with a light yellow stripe running down its back. The larval stage lasts for 2 to 3 weeks, depending on temperature. 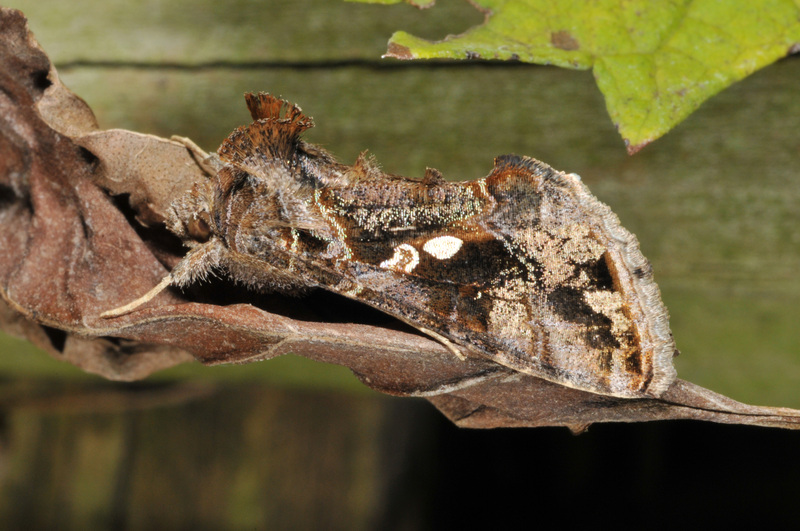 The larvae can consume enough leaf material to reduce plant growth; can feed on the head, making it unmarketable, and can foul the head with excrement. The cabbage looper does not overwinter in Indiana, but flies into the state each spring from more southerly locations. The adult is a rather nondescript night-flying moth with a wingspan of 1-1/2 inches. Each forewing has a white “Figure 8” against a greyish background. The eggs are laid in groups on the lower leaves. Larvae are light green with a white stripe along each side of the body. They reach a length of 1 1/2 inches when mature. When they crawl, the central region of the body is pushed up into a hump, thus the name looper. 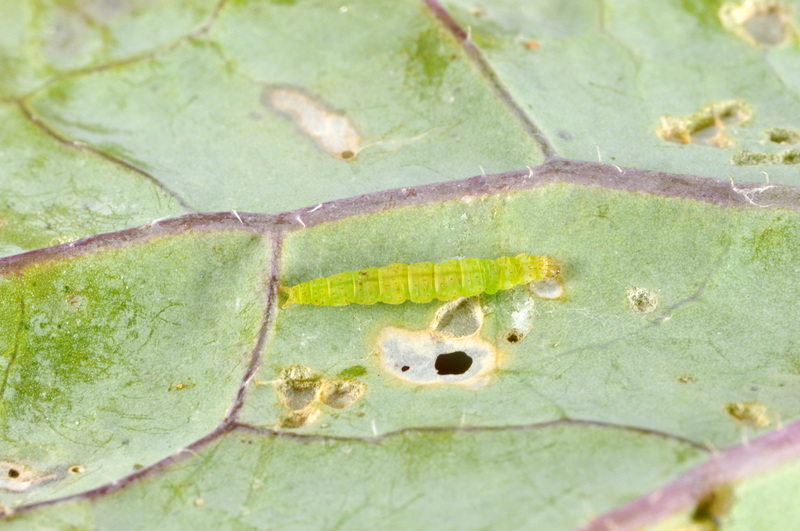 This behavior can be used to distinguish cabbage loopers from the other caterpillars found on crucifers. Pupae are found in a cocoon on the underside of leaves. Loopers tend to be more of a later season problem, with the timing of their arrival here depending on when conditions are right for them to fly or be blown up from the South. 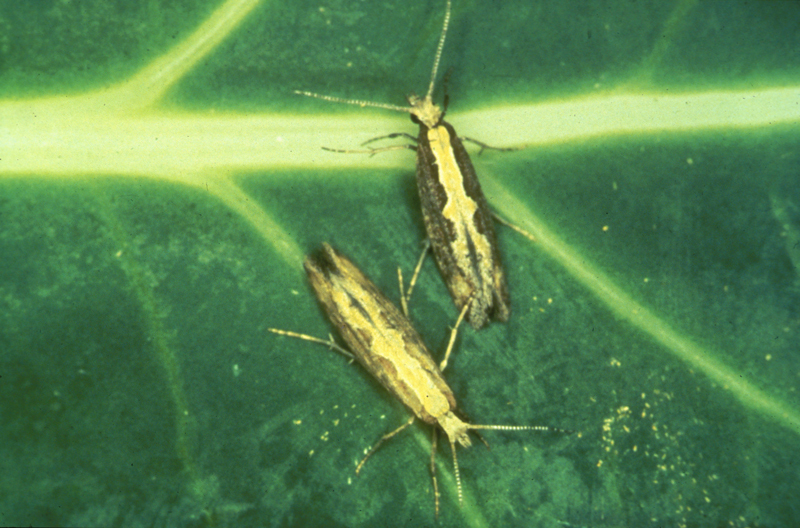 The adult stage of the diamondback moth is a very small (1/3 - 1/2 inch), slender moth that, with its wings folded, appears to have a row of three diamond-shaped yellow spots in the middle of the back. 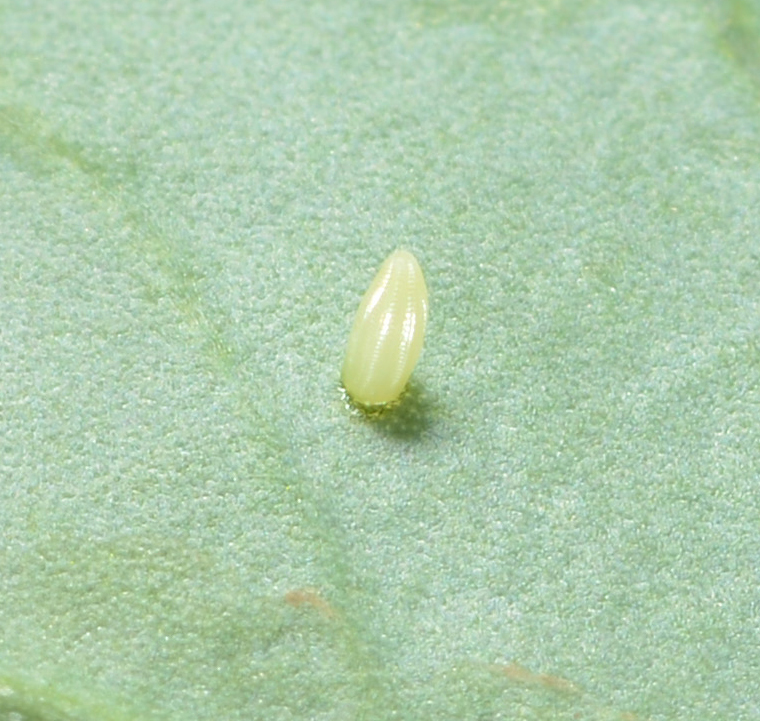 The eggs are small, round, and yellowish-white and are laid singly or in groups of 2 or 3 on the underside of leaves. The larvae are much smaller than those of the other two caterpillar species, reaching a maximum length of 1/3 inch. They can also be identified because of their vigorous wriggling behavior or by their dropping from the plant by a silken thread when disturbed. The larvae are pale greenish-yellow and pointed at both ends. The larvae can complete development in as little as 10 days when temperatures are warm. Pupa can be found on the underside of leaves, wrapped in delicate, silken cocoons. All three of these caterpillar species cause similar feeding damage. 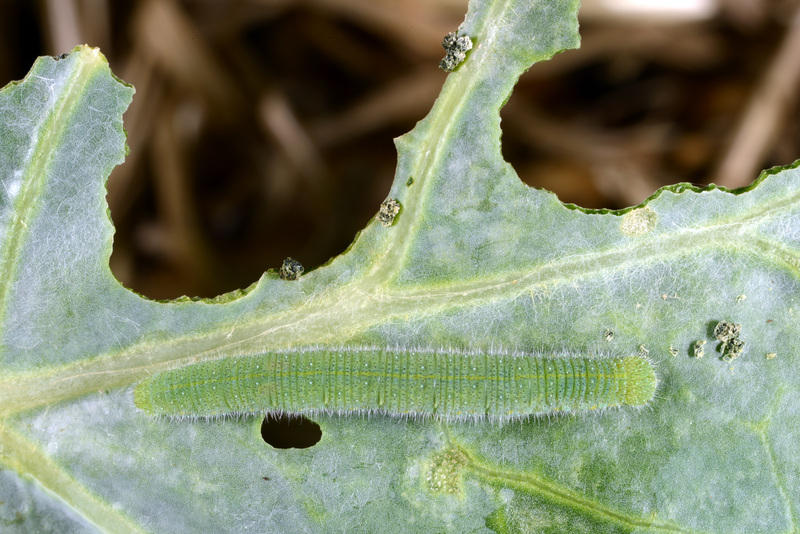 However, each cabbage looper larva will consume more foliage than an imported cabbageworm and much more than a diamondback moth larva. Most crucifers can tolerate a substantial amount of leaf feeding with no impact on yield (Table 1). 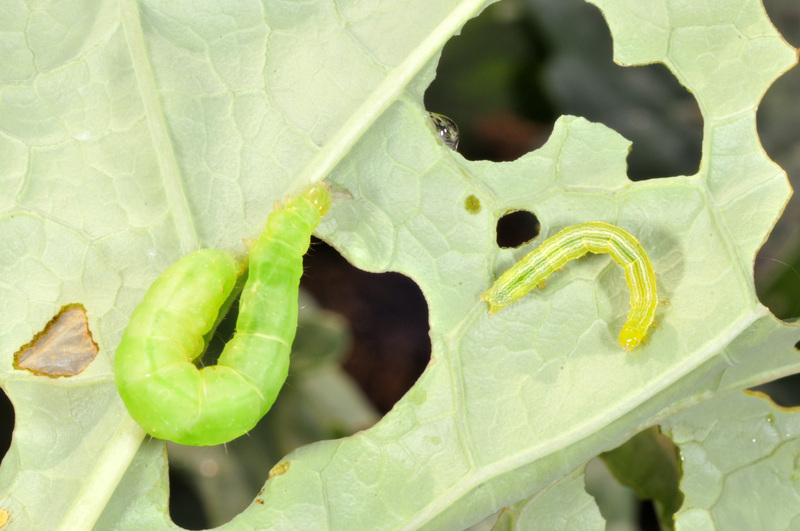 Cabbage is fairly tolerant to leaf feeding, but care must be taken that the caterpillars do not feed on the heart leaves, which could prevent head formation, or within the head, which could render the head unmarketable. Cauliflower and broccoli can tolerate substantial feeding on the leaves, but any feeding on the heads must be avoided. Radishes and turnips grown for roots can tolerate significant feeding damage. However, turnips grown for greens, collard, and mustard must be well protected, because the leaves are the marketable portion of the crop. Each of the species is attacked by a number of parasites and predators and is susceptible to several diseases. These natural enemies are an important part of any caterpillar management program, and every effort should be made to preserve them. Organic methods for controlling caterpillars on crucifiers include Bt insecticides (Agree, Biobit, Dipel, Javelin, Lepinox, Xentari) or Entrust. These insecticides provide good control of all three species, they are nontoxic to parasites and predators of the caterpillars and of the other pests of crucifers, and there is no problem with residues or environmental contamination. There are a number of other insecticides available that will provide excellent control of these caterpillars, including Ambush, Asana, Avaunt, Baythroid, Brigade, Confirm, Coragen, Exirel, Intrepid, Larvin, Mustang Maxx, Proclaim, Radiant, Rimon, and Warrior.